On July 18 thousands of activists and dozens of organizations will converge on downtown Detroit to protest the privatization of the city’s assets and the disconnection of water to tens of thousands of low-income residents. The UN has called the shutoff a human rights violation. Demonstrators from around the country will rally in Hart Plaza at 1 pm, linking arms with the citizens of Detroit to protest the hostile corporate takeover by Wall Street banks and their ALEC-led political allies in the Michigan Statehouse, including Governor Rick Snyder. July 18 marks the one-year anniversary of the announcement by Emergency Manager Kevyn Orr that Detroit must file for bankruptcy—a decision that County Judge Rosemarie Aquilina immediately ruled violates the Michigan Constitution and state law and must be withdrawn. “I have some very serious concerns because there was this rush to bankruptcy court that didn’t have to occur and shouldn’t have occurred,” Aquilina stated. Orr and Snyder managed to circumvent her ruling, and the bankruptcy proceeded. The next few months will determine how successful they will be. 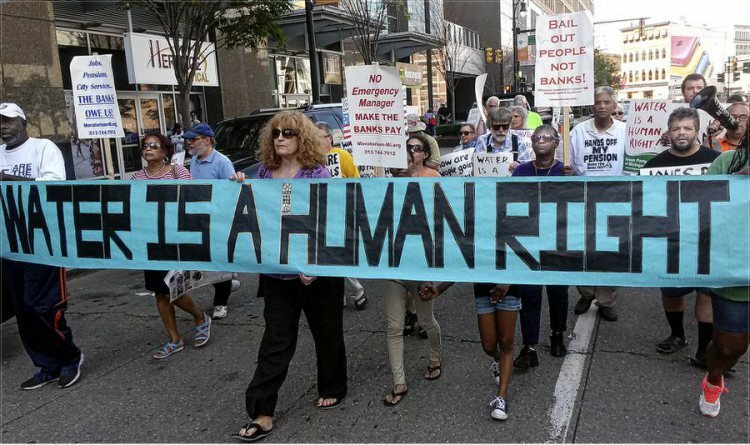 “We call on activists everywhere to come to Detroit on Friday, July 18th, for a rally and march to fight the dictatorship of emergency manager Kevyn Orr, appointed by millionaire Republican Governor Rick Snyder, and backed by Wall Street bankers and the 1 percent. Under a state-imposed bankruptcy, the City of Detroit workers face severe cuts to their pensions and tens of thousand people face water shut-offs. “The banks, which have destroyed Detroit’s neighborhoods through racist predatory sub-prime mortgages and saddled the city of Detroit with fraudulent financing, continue to loot the people of Detroit. The people of Detroit, 83 percent of whom are African American, know that their crisis was manipulated to force bankruptcy. In 2012, they fought to get a public initiative on the Michigan ballot, which overwhelmingly defeated Public Act 4, the anti-democratic law that granted the emergency manager complete authority over local officials, the power to nullify public rulings and bodies, and to strip unions of collective bargaining rights and health benefits. But so intent were the right-wing legislature and Governor Rick Snyder to subvert the will of the people that in a lame duck session immediately following the referendum, the legislature issued a newer version of the law, Public Act 436, which they attached to an appropriation bill. It was a parliamentary trick that eliminated the possibility of another referendum. Many Detroiters believe that the aggressive foreclosures and water shutoffs are a deliberate scheme to shock the population, drive longtime residents out of the city center, seize property, and gentrify downtown Detroit and the waterfront. This game-plan was played out in Benton Harbor, Michigan, also forced into emergency management, where corporate vultures grabbed a chunk of the city’s waterfront to build a golf course. Detroit was no more “bankrupt” than many American cities suffering post-2008 loss of their real estate tax base, a crisis caused directly by Wall Street and the very same banks now promoting Detroit’s bankruptcy. Motor City was particularly devastated by the sub-prime mortgage schemes, which targeted African-Americans, whom the banks knew could not afford the loans they promoted. Detroit had the largest percentage of sub-prime victims per capita of any city in the United States. Foreclosures rates continue to be among the highest in the country. The 2008 Ponzi scheme market collapse also led to $1.5 billion in budget-fix loans foisted on Detroit by a bank consortium led by Bank of America — loans connected to the LIBOR interest rate manipulation crimes, for which the banks were indicted and fined. According to Bloomberg News, these faulty loans were coupled with unnecessary default insurance schemes sold by disreputable brokers to a corrupt Detroit mayor, who saddled the city with over $474 million in default swap costs. The mayor was later convicted and jailed on charges of racketeering and bribery. But the banks were given a free ride, and now demand full payment. Many cities with almost the same financial red ink as Detroit, including Chicago, renegotiated bad loans with help from their state capitols, but Detroit is being held hostage. After the right-wing takeover of Michigan’s legislature in 2010, and the election of Governor Snyder, the Tea Party-led Republicans repealed the business tax so that the state lost over a billion dollars in revenue in 2013 alone, replacing it with $1.8 billion in cuts to schools. The legislature then backed out of previously allocated revenue-sharing funds to the city. The same right-wing politicians and business interests then deliberately confused long-term solvency of the city pension obligations with short-term cash flow to accentuate the appearance of a financial crisis, according to Tom Barrow, mayoral candidate, CPA, and former head of the Michigan Licensing Board of Accountancy. Emergency Manager Orr, coincidentally also a former Jones Day partner, claimed he only made the “tough decision to file bankruptcy reluctantly after thorough negotiations with creditors, pension trustees and public sector unions.” In fact, Orr, Snyder, Detroit’s Democratic mayor, and the powerful financial interests behind them had conspired for months to use federal bankruptcy laws to circumvent legal obstacles regarding pensions, according to the leaked emails dating back to January 2013, provided by Robert Davis, a local political figure associated with AFCSME. Tom Barrow described how Orr and Snyder surreptitiously rushed to preempt an injunction filed by pension trustees and public-sector unions who were seeking to block bankruptcy on the grounds that it would lead to unconstitutional pension cuts. While in court, attorneys for Snyder asked for a courtesy five-minute delay, during which Orr’s attorneys surreptitiously filed the bankruptcy petition, preempting the injunction. The bankruptcy continues to slog through the courts, even though it became evident that Detroit’s financial “emergency” was as blatant a fabrication as the WMDs — the weapons of mass “distraction” contrived as the rationale for the privatized invasion and occupation of Iraq. Detroiters are witnessing the same “shock” strategy used internationally by right-wing ideologues who employ corrupt political, military and police power to advance the so-called free market reform. This long-term agenda of the Milton Friedman Chicago School of Economics is actually a formula for aggressive public asset seizure. In her seminal book, Shock Doctrine, Naomi Klein explains how historically a “softening up” process of collective shocks have been employed by the Chicago School internationally to stun the populace, paralyze their democratic process, and force austerity and mass-privatization down their throats through Structural Adjustment Programs (SAP)–see Detroit’s Emergency “Plan of Adjustment”–that literally sap the lifeblood and wealth of nations. Such vulture capitalism attacks were perpetrated in Chile and Argentina with the aid of corrupt dictators. In Russia and China, political suppression “shocks” preceded a privatization of public assets by Russian oligarchs and Chinese Communist Party “Princelings.” After the austerity and privatizations, average citizens inevitably found themselves poorer as excessive debt was serviced off their backs, and lacking in basic public services and education. Now “shock doctrine” has come home to the United States. Detroit has become Ground Zero for a massive new wave of asset seizures, repression, and corporate exploitation that is beginning to sweep U.S. communities and states, privatizing our schools, water assets and government services. With the end of the Iraq war, and as Latin American democracies reject bank-iinduced debt and austerity, these parasites who prey on civil society have turned their attention from neo-colonialist exploitation to cannibalism at home. Many in Michigan believe the city could have managed its financial troubles on its own, but Motown was defamed and derided by repeated newspaper editorials, the outstate right wing, and the controlling majority in the legislature as profligate and promiscuous financially. Detroit’s citizens were stripped of their right to local political control by democratically elected representatives. Detroit is not the first predominantly African-American city subjected to this kind of exploitation. Post-Katrina New Orleans (60 percent African American) was also abandoned and exploited by the political class. In Birmingham Alabama (74 percent minority), JP Morgan was convicted of bribing local power brokers and extracting millions in fees that turned a $250 million dollar sewer project in Jefferson County into a $3 billion debacle. While the county slashed services and laid off almost 1,000 workers. JP Morgan settled in court for $1.6 billion, their profits soared, and their municipal-debt underwriting business – over $64 billion, including Detroit – remained mostly unscathed by the scandal. • The tens of billions of dollars in value represented by the city’s huge water systems infrastructure, which supplies 40 percent of Michigan, and sits on 21 percent of the surface fresh water supply of the world. • The billions of dollars in Detroit property that could be gentrified and developed once the cronies of the real estate vultures have pushed out its African-American residents. • An art museum with a collection valued at billions of dollars. • The hundreds of billions of invested capital that are promised to the city pension plans. The clear attack on pensions is why many Detroit pensioners are voting no to the insidious “grand bargain” being offered right now in the enforced bankruptcy. Pensioners and current employees are being threatened with deeper cuts, if they don’t vote to accept a set of long-term reduction in payments and health benefits, and sign away their right to sue later. The pawns in this crisis, the impoverished residents of Detroit, have already suffered the globalization of this rust belt region, as corporations took their production south, and then abroad. Motor City’s population has been reduced from 1.5 million at its apex in the fifties, to just over 700,000. Half the housing stock is abandoned or set on fire and looted, while city services operate at a fraction of past accommodations—crippling citizen’s ability to work and care for their children. The last thing they need is to be viciously set upon by the governor and his “Manager” who now threaten their health by shutting off the water, often without notice, of any resident who is overdue sixty days, on as little as $150 dollars. Millions of dollars are still owed to the city water department by golf courses, sports arenas and other businesses, and by thousands of homes foreclosed and now owned by banks or corporations, but these have not been subjected to water shut off, even with bills months or years overdue. As we write this story, on the 4th of July, we believe the people of Detroit have the right to refuse their “consent” to be governed by a vicious regime foisted on them by an imperialist governor. They would be well within the bounds of justice to demand their “unalienable rights,” starting with water for their families, and to keep their pensions, which are protected by the Constitution of the State of Michigan. Detroit is part of the heart and soul of America. Its path should be decided by the people of Detroit themselves, who deserve basic respect, human dignity, and enough water to plant and grow the seeds of their future. All of you out there in the American heartland, in Michigan and the Midwest, in Chicago, Madison, Toledo, we implore you to “do the right thing” — get in your cars, on buses and trains, and come to Detroit on July 18, 2014.